Several stoplights along Palmdale Boulevard were not working Saturday morning. 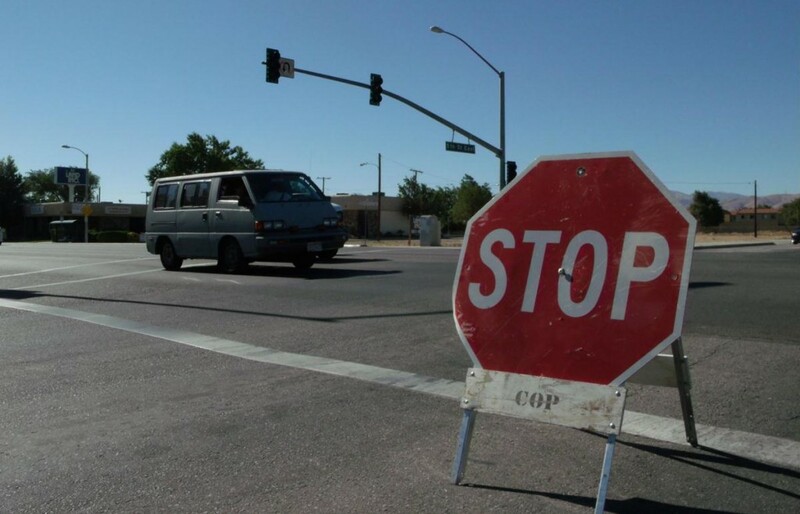 Authorities placed stop signs to assist with traffic flow. Photo by LUIS MEZA. A suspected drunk driver crashed into this transformer box, which caused the widespread power outage, authorities said. Photo by LUIS MEZA. PALMDALE – A single-vehicle crash early Saturday morning caused a widespread power outage in downtown Palmdale that was still not complete restored as of 12 p.m. Saturday afternoon. 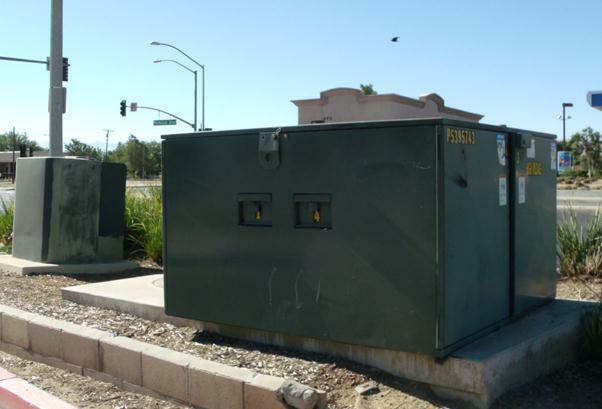 The collision happened around 3 a.m., when a suspected drunk driver slammed into an electrical transformer box at the corner of 5th Street East and Palmdale Boulevard, authorities said. The crash caused a small fire, which was quickly extinguished. But the damage was far reaching. Several businesses and homes along Palmdale Boulevard, from 5th Street East to as far as 40th Street East, and about a mile north and south of Palmdale Boulevard, were still without power as of Saturday afternoon. Many streetlights along Palmdale Boulevard were also affected, forcing authorities to post stop signs to assist with traffic flow. Many businesses on Palmdale Blvd. 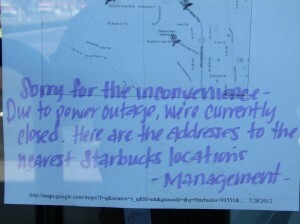 posted signs notifying customers they were closed for the day due to the outage. Photo by LUIS MEZA. Many businesses in downtown Palmdale simply closed their doors for the day. The Palmdale Sheriff’s Station was also affected by the power outage and had to resort to using a back-up generator, but not before the outage wreaked havoc on their computers and other electronic equipment. Power was restored to the Palmdale Station at 6 a.m., officials said. About 65 customers are still impacted, according to an alert posted on the Southern California Edison website at 12:01 p.m.
Crews are in the process of completing repairs, and the estimated restoration time for all power to the area is 6 a.m. Sunday, according to the Southern California Edison alert. UPDATED 7/29/12: Power was restored on schedule for all affected areas. 5 comments for "Suspected DUI crash causes widespread power outage"
What ever happened to that checkpoint, or that 14 freeway safety and no drunk driving cooridor..
Yep….what great deterrents those checkpoints are! So much for the DUI checkpoint last night.